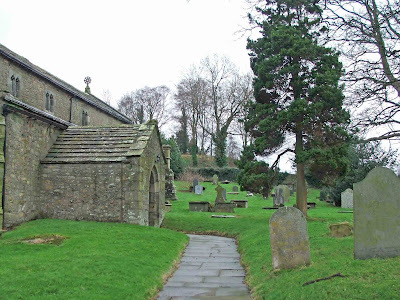 Travelling through Melling, a small village in Lancashire, the church of St Wilfrid’s lays on your left hand side. The church was built in the 13th century, and vastly rebuilt and redesigned right up until the late 19th century. Local legend has it, that it has suffered serious damage at the hands of invading Scottish armies, but there really isn't that much documentary evidence to suggest that this is the case. A view of the motte from within the church yard, looking East. 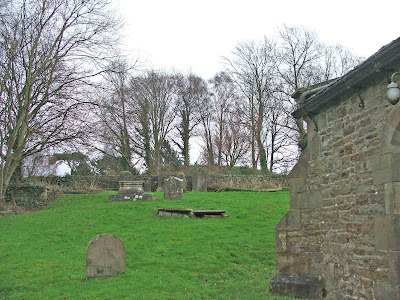 If you park up, and walk into the church yard, you notice that the grave yard begins to slope upwards towards the boundary wall. This slight raise in the earth towards the back of the church yard may well be all that is left of the castle’s bailey. If you look over the wall, into the Vicarage gardens, the motte sits in the middle of the garden. A view of the motte from over the wall of the church yard, looking East. The motte is about 6 metres high, and extremely overgrown. There are a couple of well established trees sprouting from its sides. Unfortunately, the earthwork remains have been damaged by landscape gardening around the base, but on the whole, it’s in good condition. As with Arkholme and Whittington, Melling motte is situated right next to the church. It is suggested that in all three instances, the churches were built on the baileys, and may at some stage, have been manorial chapels\churches built for the express use of the owners and occupiers of the respective castles. This would adequately explain the lack of any discernable bailey at each site. 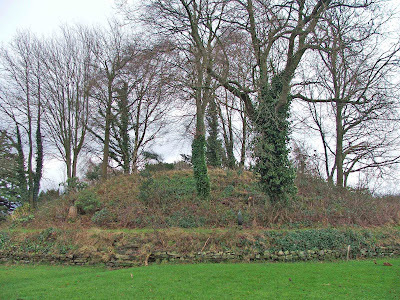 The motte measures around 38 metres in diameter, and is around 6 metres tall, although the mound is higher when measured from the lowest point in the church yard. Another view of the motte from within the churchyard, this time from the North side of the church. The motte lays in the garden of the vicarage, which is off to the left of this photo. It is interesting to note, that the castle is no longer anywhere near to the river Lune. There is evidence to suggest that the river’s course has altered greatly over the last 700 years, and that when the castle was being used in the 12th or 13th centuries, it was nearer to the river side. The river Lune must now be at least a quarter of a mile to the West.